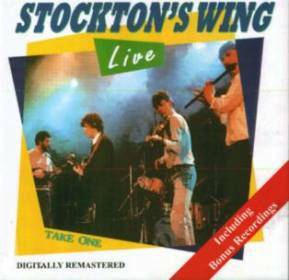 Truth be told, neither time nor tide has been kind to Stockton’s Wing, as this live album from 1985 amply demonstrates. For those who are not familiar with the band, the Wing (as they were often known) was originally a five-piece consisting of percussionist Tommy Hayes, fiddler Maurice Lennon, banjo and mandolin player Kieran Hanrahan, Paul Roche on whistles and flute and Tony Callanan on guitar and vocals. The band’s self-titled 1978 debut album and its successor, Take a Chance, were solidly traditional affairs. However, by the time of 1982’s Light in the Western Sky, Kieran’s brother Mike had replaced Callanan and the band was revealing increasing interest in not only said new arrival’s self-penned MoR songs, but in sub-Moving Hearts arrangements of traditional tunes. Nonetheless, Light in the Western Sky (an album strangely never reissued by the Tara label) proved to be one of the successes of the decade, not least thanks to Mike’s song Walk Away, and garnered further success across Europe and in North America. All told, Stockton’s Wing probably played more gigs both at home and in Europe (including more than 30 at Harlesden’s Mean Fiddler) during the 1980s than any other Irish band. By the time of this live recording, laid down in venues in Galway and Dublin in 1985, they were certainly a well-honed unit in terms of performance, but one that had sadly lost the plot musically. Furthermore, as Take One thoroughly reveals, this is an album of its time, a matter no more clearly defined than by the addition of drummer Fran Breen and bassist Tony Molloy to the remaining quartet of Lennon, Roche and the Hanrahans. Molloy had clearly been listening to his Chic albums as his introduction to Steve Cooney’s Skidoo reveals (apologies for forgetting to mention that said Cooney played bass with the band in the early 1980s). Mike Hanrahan’s anodyne songs (Walk Away, Beautiful Affair and In Our World) glean raucous reaction from a clearly tanked-up audience and, true, there are some wild instrumental work-outs on Skidoo and The Mason’s Apron, but one might probably rightly reckon that the bars of Galway’s Great Southern Hotel were packed during the Roche-composed instrumental Silent Dreams. This new edition of the album proudly boasts ‘bonus recordings’, but, in reality, these transpire to be studio recordings of three of the live tracks – hardly an effective marketing ploy. If you want to hear the Wing when they were truly flying, check the band’s debut album (still available from Tara – www.taramusic.com) and there’s apparently archive material available at www.stocktonswinglive.com.